I get asked a lot at market: how do you know that the bees actually went to “that” honey. “That” honey may be Buckwheat, Alfalfa/Wildflower, Fireweed/Wildflower, or Wildflowers of particular regions in Washington State. Really it is all about flight distance, desirability, and availability. Bees have been known to go to 7 miles, but few are ever found beyond 4 miles from the hive. The further they travel, the energy they use begins to be greater than the energy they get from the distant forage. Bees tend to eat what’s right in front of them In that way, they’re rather like us: there is undoubtedly a great Indian restaurant in Seattle (2.5 hours away), but I tend to head down to Bellingham (45 minutes away). Bees will fly further if the immediate forage isn’t their favorite: not enough nectar, pollen, or protein – bees tend to over-fly alfalfa because they apparently never been not all that keen on alfalfa (even before the advent of 21st century agriculture). Bees check out plants by sight and smell, but it’s way different from ours: large swatches of color are easier to see than a single brilliant plant, and smells can tickle their “toes” and legs. This means that the primary floral source for that honey was the flower on the label. Other flowers are so minimal their nectar is diluted under the primary flower. Beekeepers and farmers consider another aspect of foraging distance to be equally, and potentially, more important. This is the distance of the hives from pesticides, fungicides and herbicides. How far away do hives need to be from a potentially harmful location? This location may be fields using neonicotides (banned in the EU and in some areas in the US, but still used in abundance US agriculture), or an area sprayed with other pesticides, fungicides or herbicides, that are harmful to honeybees. This harm from these poisons may be immediate, as in the bees are sprayed and they die. The harm can also be pesticides, herbicides and fungicides in stored pollen and nectar. In these instances, the bees die when they eat these tainted stores later in the year. Beekeepers may be in search of stands of untreated bee forage. The mileage between a seemingly pristine meadow and sprayed crops can be critical. The 2.5 mileage the bees fly from their hive is an average – so some bees may be foraging further – into areas of pesticides. Farmers who want to keep their seed crops free of Genetically Modified genes can see all pollinators as a benefit or a problem. Cross pollination by foraging bees hauling pollen from a GMO plant to a similar, but non-GMO plant can cause havoc, and potentially destroy non-GMO’s farmers’ operations. In all of the above cases, hives would have to be in the center of about 25 square mile pesticide-free area to be pretty sure they are not going to encounter harmful chemicals. To be absolutely certain that the hives and/or fields are isolated from pesticides and/or GMO pollen that distance expands to 196 square miles. Place a hive in the center of a square Draw a 2.5 mile line “east” and another “west” : you get a 5 miles. This gives 14 miles per side or 196 square miles. Depressing isn’t it? Not the math, the distance – if you’re trying to get as close to a “pure” varietal honey or get away from agriculture. How Do We Know How Far Honeybees Fly? 60 years later, in 2008, in their research entitled “Crop Pollination” Hoopingarner and Waller came up with slightly different numbers: their honeybees could cover 12,000 acres during flights reaching 2.5 miles from their hives. Their bees also flew 5 to 8 miles to collect forage they found attractive. It’s all down to flight distance and the attractiveness of the forage to the bees – a bit of working knowledge, observation and the hard work by researchers and scientists. An aside: I like research and enjoy reading the papers that result from scientific studies, but at times it seems like translating. Simply Stated: Animals want food that gives them more energy than they used to get the food. That’s the news from Brookfield Farm Bees and Honey here is chilly, but not snowy – I’m happy to say – Maple Falls, Washington. The bees here are all in cluster although they all popped out about a week ago when we had an unseasonably warm day of 50F – break out the bathing suits…. This entry was posted in Beekeeping, Honeybee Biology, Honeybees -interesting stuff and tagged Beekeeping, bees, Brookfield Farm, distances, find, flight, food, forage, honeybees, how, Maple Falls, Washington. Bookmark the permalink. 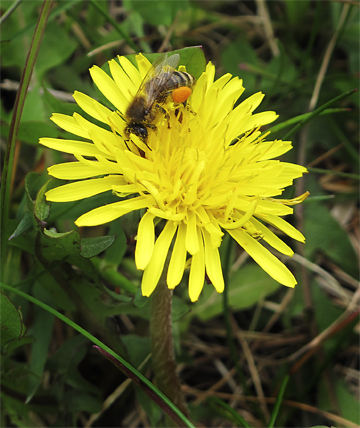 2 Responses to Honeybee Food Foraging : Where? Why? How Far? I have 2 humming bird feeders that I keep filled with store bought powder that mixes with water. I have hardly ever seen a hummingbird at them but there are lots of honey bees that drink it up. Am I harming them or helping them by keeping it filled for them? Hi kathy – sorry for the delay in getting back to you. I think those store mixes are sugar and food coloring. I could be wrong, but going with that assumption you’re not hurting the bees. There is probably very little nectar available when they are going to your bird feeder, and they can metabolize cane sugar. The small amount they are taking shouldn’t affect anything, but were they to eat vast amounts of the food coloring, it would color their honey! There was an issue at an M&Ms plant where bees got to vats of colored sugar and it ruined the beekeepers’ honey. If you want to keep feeding them, I’d make the mix out of cane sugar, just to be safe (humming birds might like it better too).